World War I was over and Bob Koehler was relaxing on a Saturday at his family’s summer retreat in southwestern Michigan when the Chicago Daily Tribune captioned an article, “PURPLE COACH TO VISIT KOEHLER, ‘GRID HOLDOUT.’” It was August 30, 1919, and the college football season was getting close when the Tribune explained that Northwestern head football coach Charles Bachman and trainer “Wee Willie” McGill were off to Sister Lakes “to talk business with Bob Koehler, star full back, who is eligible for another year of conference football. There have been rumors that the great line smasher would not return to the Evanston school, and Bachman intends to get a little first hand (sic) information.” Koehler did go back, but didn’t have the kind of year he wanted. Little is known of Koehler’s early life other than his family often moved around the south side of Chicago – always near the old Armour Institute [today’s Illinois Institute of Technology] – before he attended his neighborhood’s Wendell Phillips High School as a star athlete. In 1915 he entered Northwestern University and played freshman football. In 1916 he lettered in football and in the fall of 1917 was the biggest star on a 5-2 team gaining First Team All-Big Ten, All-Western College, and All-American honors. He also lettered as a catcher in baseball in 1917 and basketball center in 1918. On April 10, 1918, he joined the U.S. Navy Reserve and was stationed on Chicago’s Municipal [soon to be renamed Navy] Pier. In October, Ensign Koehler was elected captain of the pier football team that later in the season crushed his depleted Alma Mater 25-0. Koehler exited the reserves in April 1919 and returned to school that fall. He was elected captain of the team but after early hurting an ankle, often did little beyond calling the coin flip. He eventually earned his letter on a team that only won two of seven games. School records indicate that he received his B. S. degree in 1929 and not in 1920 so it appears that instead of finishing required classes he decided to turn professional when invited by George Halas to come to Decatur. Unfortunately the injury bug followed him to the Soy City as he hurt his knee in the very first game on October 3 in the win over the Moline Tractors and missed two games. However, by the end of that month he must have been much better as he and the other ten starters played the entire game, offense and defense, without a substitution in a 0-0 tie against Rock Island. He started at fullback in the final seven league sanctioned and unsanctioned games. Koehler scored the only Staley touch down in the November 28 [6-7] loss to the Racine [Chicago] Cardinals in Normal Park. It was the only game Staley lost that year. The following Sunday in Cubs Park, Koehler again scored the only Decatur touch down in a repeat game against the Cardinals as the Staleys defeated Bob’s future teammates 10-0 on December 5, 1920. The Chicago Tribune reported the crowd to be 11,000 people and opined that it was “the largest crowd in the history of local pro football…” In addition to his $50 a week salary for working at Staleys, Koehler received a $1600 bonus for playing football for the Starchmen. In 1921 Koehler decided to stay in Chicago and play with and for his former Northwestern teammate, Paddy Driscoll, the Cardinal’s quarterback and coach. 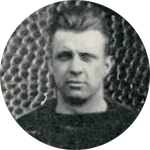 Through the 1926 season, Koehler played at least 62 more games at fullback and linebacker for the Cardinals, with annual games against his former Staley teammates. At the same time, he started an 18-year career teaching and coaching football at Schurz High School where he won three Chicago city championships. In 1941 he transferred to Lane Technical High School as head football coach. At the end of the 1949 school year he took a sick leave for two months and on July 1 died at his summer home in unincorporated Sister Lakes, ironically very near Decatur, Michigan. Bob Koehler was interred at Mount Hope Cemetery in Chicago and was survived by his wife of nearly 30 years, Jesse D. Irwin Koehler and their only child, daughter Marilyn Louise.